Happy Veteran's Day. 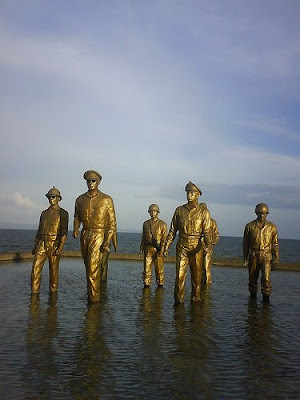 The image I've posted here is the Leyte Memorial of Douglas MacArthur's famous beach landing. My father served with MacArthur during WWII and has always told me of the many sacrifices made by the young men and women of that war. His time spent in the Philippines, Guam, Saipan, Okinawa and many others have left a lasting impression in my soul and have shaped me into the man I am today. The Philippines and Guam have always shown great pride in the accomplishments made through their teamwork with the U. S. Forces that liberated them from Japanese rule. A fair trade, many lives lost for freedom from tyranny. We should remember this always, but especially on this day, give thanks in your own way and offer a moment of silence for the young men that gave everything they had, without regard for self to ensure we would have the lives we have today. There is so much to be said for freedom. Without it, you have nothing. You are a mere animal without your own direction. For those that have served throughout the history of our great nation to defend our freedom and police the world for other nations that are unable to do so, I salute you. Our nation's debt to you is far greater than any national debt that seems to be the focus of so many these days. For the MIA/POWs, wherever you are, you are missed, you are remembered....God's speed. Good for you.. You've really seen those bronze statues? I haven't been in Leyte anyway. Anyway the fleeting visit of Americans had really influenced us Filipinos. I believe this is why we can relate to the US in many ways. My...i almost cry with what you wrote. I feel the words... even felt the suffering of those wounded heroes physically or mentally. My salute to those lives lost just to protect the freedom and preserved humanity. Deserving to be remembered! hello Daddy Joops.. great post for the Veterans Day. Indeed we need to pay our respect to those who sacrificed and honor to those who served. I agreee with you 100% Amy, some people don't realize how important it is to remember them..
Hi Umma, yeah we definitely have to respect and remember them for sacrificing their lives for us..
Hi Joops... I agree with you! Our debt to those who fought to defend our freedom and to those who did their best to uphold true democracy, are far greater than what's in focus these days. Good to read this article! I hope McArthur's promise of "I shall Return" will bring hope to every one. thanks for that warm response Cely! Is your wife came from leyte?